The Routledge Companion to Design Research offers a comprehensive examination of design research, celebrating the plurality of design research and the wide range of conceptual, methodological, technological and theoretical approaches evident in contemporary design research. This volume comprises 39 original and high quality design research chapters from contributors around the world, with offerings from the vast array of disciplines in and around modern design praxis, including areas such as industrial and product design, visual communication, interaction design, fashion design, service design, engineering and architecture. The Routledge Companion to Design Research is divided into five distinct parts with chapters that examine the nature and process of design research, the purpose of design research, and how one might embark on design research. They also explore how leading design researchers conduct their design research through formulating and asking questions in novel ways, and the creative methods and tools they use to collect and analyse data. 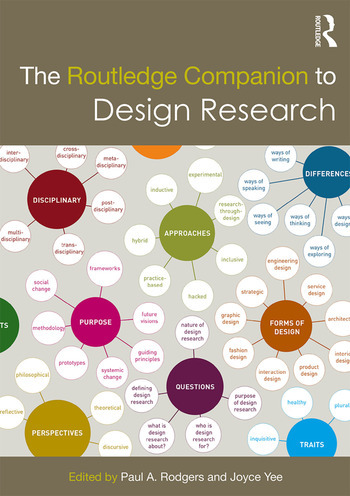 The Routledge Companion to Design Research also includes a number of case studies that illustrate how one might best communicate and disseminate design research through contributions that offer techniques for writing and publicising research. The Routledge Companion to Design Research will have wide appeal to researchers and educators in design and design-related disciplines such as engineering, business, marketing, and computing, and will make an invaluable contribution to state-of-the-art design research at postgraduate, doctoral, and post-doctoral levels and teaching across a wide range of different disciplines. Paul A. Rodgers is Professor of Design at Imagination, Lancaster University, UK. He holds undergraduate and postgraduate degrees in Design from Middlesex University and a PhD in Product Design Assessment from the University of Westminster, London. His research explores the discipline of design and how disruptive design interventions can enact positive change in health and social care and elsewhere. Joyce Yee is an Associate Professor at Northumbria School of Design, UK. She holds a BFA in Graphic Design, an MA in Visual Communication and a PhD in Design. Her research focuses on the role, value and impact of design in areas of service design and social innovation. She is also interested in the role of practice as a form of inquiry and the inherent ‘messiness’ of design methods.